How 'green' is the World Cup? 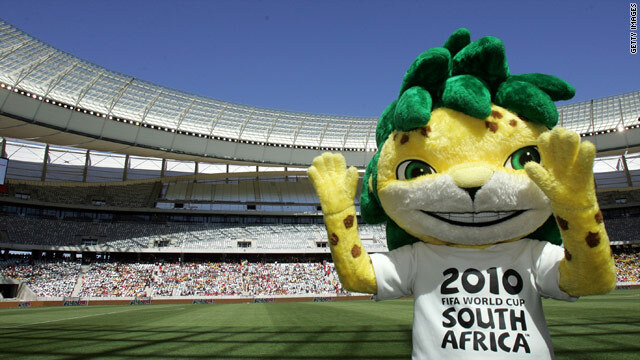 World Cup mascot Zakumi has some obvious green credentials, but many environmentalists think the country could do more. (CNN) -- In homes and workplaces around the world it's hard to find someone who is not celebrating the imminent arrival of football's World Cup. Except, that is, for many green activists who are concerned about the environmental impact of the gathering of football's global tribe. A study conducted by the Norwegian government on behalf of the South African authorities estimates the 2010 competition will have a carbon footprint 6 times the size of the last World Cup in Germany. Even allowing for the fact the study included the impact of transport to and from the World Cup, which Germany didn't, it still represents a hefty carbon footprint. In response, the South African authorities have initiated substantial offsetting programs including urban tree-planting, but for local environmental activists that's not enough. Amidst the frenzy of getting stadiums and transport routes built, the carbon footprint was largely ignored. "Once carbon is produced, claiming that offsetting is 'neutralizing' the carbon footprint is nothing more than 'greenwash'," Bobby Peek, Friends of the Earth South Africa, told CNN. "Sadly, Friends of the Earth South Africa believes nothing can be done to lessen the carbon footprint, despite the reassurances made by the various cities." Peek also claims that there have been unnecessary construction projects using thousands of tons of concrete -- one of the most carbon-intensive industries. "In Durban the construction of an entirely new stadium was not necessary considering that there were two stadiums along side each other which could have been redeveloped rather than one completely demolished to make way for a new construction," he said. "Thus the 'savings made' were negated by the need for virgin cement. The cement industry is one of the main producers of CO2. For every ton of cement there is one ton of carbon produced." Others believe the World Cup is a lost opportunity for South Africa to be a world leader in making sport greener. "I think South Africa has missed a trick in not seeking, of its own volition, to host the first 'carbon neutral' mega-event," Anton Cartwright, co-founder of Promoting Access to Carbon Equity told CNN. "It would have cost them about $25 million had they mobilized a national effort -- which they were considering at one stage, and the national Department of Environmental Affairs even got as far as calling for proposals -- but this did not happen. There is always room for improvement yet this is a milestone along South Africa's sustainable development growth path. "Had South Africa spent this money, they would have secured the event's legacy and kick-started South Africa's renewable energy and energy efficient sector, and I am not sure there is enough public awareness or political leadership on this issue in South Africa to appreciate quite what an opportunity has been passed up. "It is a pity that the national Department of Environmental Affairs never pushed through with that program. "So the buck has been passed from FIFA to national government to host cities, and at the local level not enough is being done in spite of a few brave but small exceptions. Host city efforts have been variable, with a general over-reliance on tree planting." Cartwright admits that some host cities, most notably Durban and Cape Town, have tried to initiate projects, but says in general it has been left too late. "Amidst the frenzy of getting stadiums and transport routes built, the carbon footprint was largely ignored," he said. "This is symptomatic of the space that climate change occupies in South African society and in macro-economic decision making in this country." However, the South African authorities remain adamant they have done all they can with the resources available. "Although, there is always room for improvement and learning from past mistakes... For the department and South Africa, this is yet another milestone along the country's sustainable development growth path," Albi Modise, South African Department of Environmental Affairs, told CNN. He says that while resources have been tight, there have been 200,000 trees planted in Johannesburg as part of a carbon-offsetting program, 25,000 in Rustenberg, 86,000 in Ethekwini, and a target of 400,000 in Tshwane/Pretoria. There have also been carbon reduction projects focusing on energy efficiency in street lighting in Ethekwini, Cape Town, Johannesburg, Tshwane, Rustenburg, Polokwane and Port Elizabeth. "We have also launched an SMS campaign in order to generate revenue which will feed into the offset program," said Modise. "The department has several communication and awareness initiatives that will communicate greening messages and tips [to visiting fans] in order to educate and draw awareness to sustainable environmental management." Some activists concede there may be some indirect environmental benefits from the World Cup. "One of the most positive legacies will probably come about inadvertently in the form of improved public transport and the bus-rapid-transport system specifically," said Cartwright. "In the City of Cape Town transport accounts for almost 50 percent of greenhouse gas emissions, and efforts to reduce this are important. The other important legacy is public awareness -- awareness is a prerequisite for the solutions that we so badly need, and arguably what has been most lacking."